Control this little creature and try to survive! There are so many obstacles! Just use the arrow keys in order to move through these strange place and do not forget to collect all the coins. Are you ready? Watch out! There are some obstacles here too! This is the funniest platformer game you have ever seen. Here you will guide your character through the level, avoid enemies and collect coins. 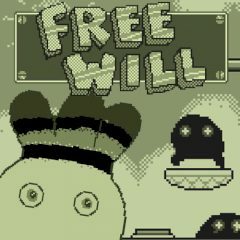 By the way, this game makes use of free will so it should complete itself? Are you ready? Then use all the skills and different objects in order not to fall down and help this little creature to stay alive. Use the arrow keys to move and be sure that you will cope with it! Well, well, you think that it is so easy? Then do not waste your precious time and have much fun here.